^ Stengs, Irene. Worshipping the Great Moderniser: King Chulalongkorn, Patron Saint of the Thai Middle Class. NUS Press. 2009-01-01. ISBN 9789971694296 （英语）. ^ Grossman, Nicholas. Chronicle of Thailand: Headline News Since 1946. Editions Didier Millet. 2009-01-01. ISBN 9789814217125 （英语）. ^ Fry, Gerald W.; Nieminen, Gayla S.; Smith, Harold E. Historical Dictionary of Thailand. Scarecrow Press. 2013-08-08. ISBN 9780810875258 （英语）. ^ International, Rotary. The Rotarian. Rotary International. 2016-10-13 （英语）. ^ Reuters. Thailand’s King Bhumibol Adulyadej, world's longest-reigning monarch, dies. 2016-10-13 [2016-10-14] –通过The Hindu. ^ A Royal Occasion speeches. Journal. Worldhop. 1996 [2006-07-05]. （原始内容存档于2006-05-12）. ^ Redmond, Brien. Thailand’s King Bhumibol Dies, Triggering Anguish and Fears of Unrest. thedailybeast.com. 2016-10-13 [2016-10-14]. ^ 8.0 8.1 8.2 Serafin, Tatiana. The World's Richest Royals. Forbes. 2010-07-07 [2015-10-17]. ^ The World's Richest Royals. Forbes. 2011-04-29 [2014-01-26]. ^ Joshua Kurlantzick. Forbes Looks into the King of Thailand's Wealth. Council on Foreign Relations. 2012-01-24 [2014-01-26]. （原始内容存档于2014-02-03）. ^ 11.0 11.1 11.2 11.3 11.4 Kohler, Chris. The business of royalty: The five richest monarchs in the world. Business Spectator. Business Spectator Pty Ltd. 2014-04-24 [2014-05-06]. ^ Simon Mortland. In Thailand, A Rare Peek at His Majesty's Balance Sheet. Forbes. 2012-01-20 [2014-01-26]. ^ BBC NEWS - Asia-Pacific - Why Thailand's king is so revered. bbc.co.uk. [2016-10-14]. ^ CNN, Jethro Mullen. Thailand's King Bhumibol leaves hospital for seaside. cnn.com. [2016-10-14]. ^ Thai king Bhumibol Adulyadej dies after 70-year reign. ^ Thailand's King Bhumibol, world's longest reigning monarch, dies at 88. ^ Matt Schiavenza. Thailand's Royal Conundrum. The Atlantic. 2015-05-31 [2016-03-29]. ^ Twilight of the King. The Economist. 2016-07-23 [2016-08-29]. ^ 19.0 19.1 Biography of His Majesty King Bhumibol Adulyadej. The Golden Jubilee Network. Kanchanapisek Network. [2015-10-17]. ^ 20.0 20.1 20.2 20.3 Grossman, Nicholas; Faulder, Dominic. King Bhumibol Adulyadej – A Life's Work. Editions Didier Millet. 2012. ISBN 9814260568. ^ 21.0 21.1 21.2 21.3 21.4 21.5 21.6 Handley, Paul M. The King Never Smiles. Yale University Press. 2006. ISBN 0-300-10682-3. ^ Bhirom Bhakdi, Soravij. Queens of the Chakri Dynasty. [2006-08-01]. （原始内容存档于2006-07-14）. ^ The Making of a Monarch. Bangkok Post. 2005-12-05 [2006-07-12]. （原始内容存档于2006-07-15）. ^ Royal Power Controversy. 2Bangkok.com. [2007-01-04]. ^ 25.0 25.1 Thak Chaloemtiarana. Thailand: The Politics of Despotic Paternalism. Social Science Association of Thailand. 1979: 98. ^ 26.0 26.1 Head, Jonathan. Why Thailand's king is so revered. BBC News. 2007-12-05 [2015-10-17]. ^ Rattanasengchanh, Phimmasone M. (2012). Thailand's Second Triumvirate: Sarit Thanarat and the military, King Bhumibol Adulyadej and the monarchy and the United States. 1957–1963 (Masters). University of Washington. ^ 28.0 28.1 Royal Birthday Address: 'King Can Do Wrong'. National Media. 2005-12-05 [2007-09-26]. （原始内容存档于2007-09-30）. ^ Suwannathat-Pian, Kobkua. Thailand's Durable Premier. Oxford University Press. 1995: 30. ISBN 967-65-3053-0. ^ The Proclamation Imposing Martial Law throughout the Kingdom. The Government Gazette of Thailand. 1957-09-16, 74 (76). ^ The Proclamation Appointing the Military Defender (PDF). The Government Gazette of Thailand. 1957-09-16, 74 (76). ^ Evans, Dr. Grant; citing Christine Gray. The Politics of Ritual and Remembrance: Laos since 1975. Laosnet.org. 1998 [2006-07-05]. ^ Evans, Dr. Grant. The Politics of Ritual and Remembrance: Laos since 1975. University of Hawaii Press. 1998: 89–113. ISBN 0-8248-2054-1. ^ Klinkajorn, Karin. Creativity and Settings of Monuments and Sites in Thailand: Conflicts and Resolution (PDF). International Council on Monuments and Sites. [2006-07-05]. （原始内容存档 (PDF)于2006-07-23）. ^ Development Without Harmony. Southeast Asian Ministers of Education Organization. 2000 [2007-09-26]. ^ BIOGRAPHY of Chamlong Srimuang. The 1992 Ramon Magsaysay Award for Government Service. Ramon Magsaysay Award Foundation. 2000 [2007-09-26]. ^ 'ประยุทธ์-เหล่าทัพ'แถลง'ควบคุมอำนาจรัฐ'. Komchadluek. 2014-05-22 [2014-05-22]. （原始内容存档于2014-05-22） （泰语）. ^ 英拉被泰国军方逮捕. 光明网. [2014-05-23]. （原始内容存档于2014-05-23）. ^ Military dominates new Thailand legislature. BBC News. 2014-08-01 [2014-08-03]. （原始内容存档于2014-08-02）. ^ Prayut elected as 29th PM. The Nation. 2014-08-21 [2014-08-21]. （原始内容存档于2014-08-23）. ^ Thailand's Junta Chief Chosen as Prime Minister. Voice of America. 2014-08-21 [2014-09-23]. ^ ‘Anchœ̄n phrabǭrommasop phrabātsomdet phračhāoyūhūa nai phrabǭrommakōt khlư̄an khabūan siphā nālikā อัญเชิญพระบรมศพพระบาทสมเด็จพระเจ้าอยู่หัวในพระบรมโกศ เคลื่อนขบวน 15.00 น. 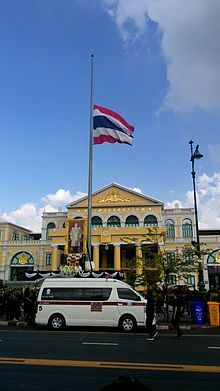 [Late king's body to be moved in procession at 15:00 hrs]. Thai Rath. Bangkok: Wacharaphon. 2016-10-14 [2016-10-14]. ^ 'My govt serves His Majesty'. The Nation. 2005-09-09 [2006-08-14]. ^ Senate steers clear of motion on Jaruvan. The Nation. 2005-10-11 [2006-08-14]. （原始内容存档于2006-08-28）. ^ 54.0 54.1 54.2 54.3 54.4 54.5 Tang, Alisa. Thailand's monarch is ruler, jazz musician. Washington Post. Associated Press. 2006-06-13 [2014-05-27]. ^ 55.0 55.1 55.2 55.3 55.4 55.5 55.6 The Jazzy King. Bangkok Post. 2006-01-10 [2014-05-27]. ^ The Heart for Art. Bangkok Post. 2006-02-06 [2006-07-20]. （原始内容存档于2006-10-26）. ^ Cummins, Peter. His Majesty King Bhumibol Adulyadej The Great: Monarch of Peace and Unity. Chiang Mai Mail. December 2004 [2006-07-20]. ^ H.M. King Bhumibol Adulyadej. Ministry of Foreign Affairs, Kingdom of Thailand. [2008-03-04]. （原始内容存档于2016-01-15）. ^ Official web site of the Radio Amateur Society of Thailand under the Royal Patronage of His Majesty the King. ^ Long Live The King!. Bangkokker. 2006-06-09 [2006-08-17]. ^ H.M. Biography. Assumption University. 2006-06-09 [2006-08-17]. （原始内容存档于2006-07-15）. ^ Thai king's patent to make rain. BBC News. 2003-03-27 [2006-08-14]. （原始内容存档于2006-06-26）. ^ Weather Modification by Royal Rainmaking Technology. 60th Celebrations. 2006-06-17 [2006-08-14]. （原始内容存档于2006-10-19）. ^ Thai King gets rainmaking patent. 60th Celebrations. 2006-06-09 [2006-08-14]. （原始内容存档于2006-06-30）. ^ Horn, Robert. The Banker Who Saved A King. Time Asia. 1999-12-06 [2006-07-05]. ^ Horn, Robert. Forbes The world's richest royals. Forbes. 2008-08-20 [2008-08-21]. ^ Forbes Says Bhumipol Richest Person in World. ASTV. 2008-08-23 [2015-10-17] （泰语）. ^ Pendelton, Devon; Serafin, Tatiana. The World's Richest Royals. Forbes. 2007-08-30 [2008-03-04]. （原始内容存档于2008-03-03）. ^ 70.0 70.1 70.2 Thailand's Royal Wealth: How Thailand's Royals Manage to Own All the Good Stuff. Asia Sentinel. 2007-03-01 [2007-09-25]. （原始内容存档于2007-09-27）. ^ King Bhumibol as world's wealthiest royal: Forbes. Manager Online (New York). AFP. 2008-08-22 [2016-10-13]. ^ Champion, Paul. Professor in lese majeste row. Reuters. 2007-09-25 [2007-09-25]. （原始内容存档于2007-10-13）. ^ Biography of Her Royal Highness Princess Maha Chakri Sirindhorn. The Golden Jubilee Network. 2004 [2006-07-05]. （原始内容存档于2006-07-02）.